Composed by Martin Stolz. Jazz, Method, Etudes and Exercises, General Instructional, Technique Training. 51 pages. Published by Martin Stolz (S0.304331). 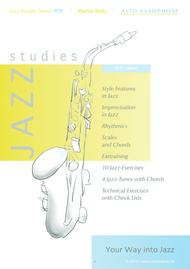 "Jazz-Studies" opens the gate to the world of Jazz for the student. 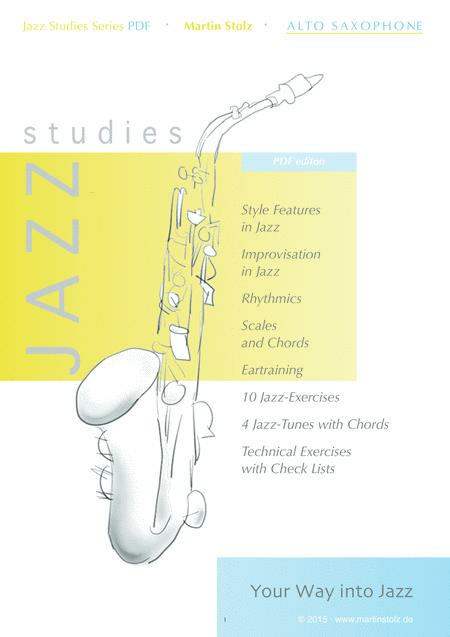 This book gives the student an understanding of the basics of improvisation, phrasing, rhythm and eartraining through special exercises, explanations and samples. Through practising check lists, which can be printed out, the student has the possibility of developing his technical skills systematically. At each exercise tips, hints or explanations or advices for practising are provided for the student so he can master the exercise in a better way. 4 Jazz tunes give the student the possibility of using the skills he got from the exercises at a "Jazz piece". These tunes are based on common song forms of Jazz (Blues, Rhythm Changes, Misty ect. ) . Compositional elements and also basics of harmonics are made accessible to the student. He is encouraged to improvise in various ways over the song forms, to vary melodies or to compose.